It’s been quite a while since I’ve writ­ten any­thing on the sub­ject of Magic: The Gathering, the ex­pla­na­tion for which is a whole ar­ti­cle in of it­self, so I want­ed to take this op­por­tu­ni­ty to give a snap­shot of the cur­rent state of the game of Magic, as there have been some im­por­tant de­vel­op­ments in play­er ex­pe­ri­ence. 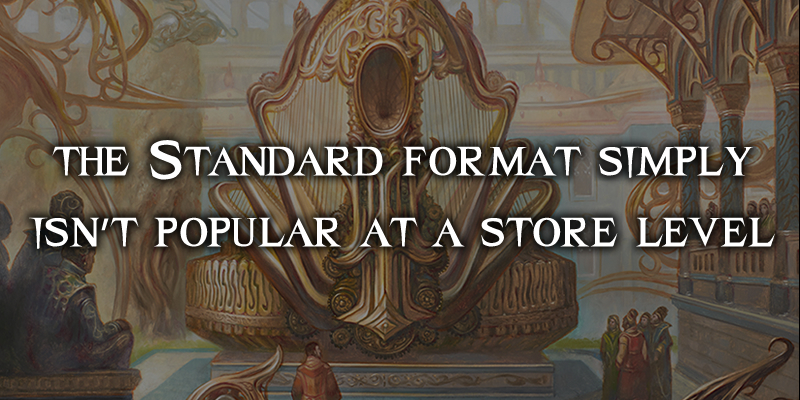 These changes have come about through how Wizards of the Coast cu­rates the Standard for­mat. 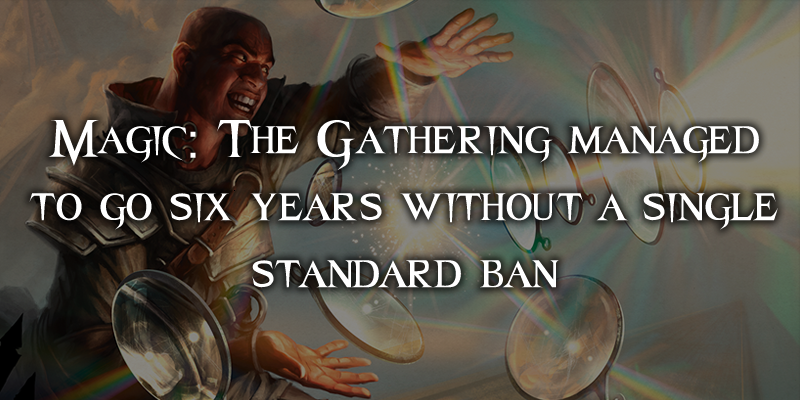 For some­one who only start­ed fol­low­ing the Magic: The Gathering news cy­cle close­ly in the past few years, bans in stan­dard are com­plete­ly alien, but on January 9th 2017 Wizard’s of the Coast an­nounced a ban of three cards in stan­dard: Emrakul, the Promised End, Smuggler’s Copter and Reflector Mage. These bans were brought for­ward a week from when Wizard’s usu­al­ly an­nounces bans so ur­gent was the per­cep­tion of the prob­lem. Since then Wizards of the Coast has made an ad­di­tion­al ban of Felidar Guardian, again out­side of the usu­al ban an­nounce­ment cy­cle. The flood­gates have opened and it seems Wizards is now un­afraid to is­sue bans on mul­ti­ple cards over mul­ti­ple re­leas­es if they feel it will make the for­mat health­i­er. These bans are also in­ter­est­ing as they’re most­ly of com­bo pieces or pay­loads, with many pieces of their com­bo re­main­ing le­gal in stan­dard. There is a per­cep­tion amongst stan­dard play­ers right now of a large num­ber of prob­lem cards still weigh­ing down the for­mat. Part of me sym­pa­thizes some­what with Wizards of the Coast; you should en­sure that when cards warp a for­mat to the point all oth­er strate­gies are sub‐optimal that you are will­ing to fix that — even if it means ban­ning a card. As a game, Magic: The Gathering man­aged to go six years with­out a sin­gle stan­dard ban, this pe­ri­od also marked some­what of a re­vival for the game and saw play­er num­bers surge. With Wizard of the Coast’s much tout­ed R&D process, bans in stan­dard are seen as a fail­ure state for the game. This is for good rea­son: sets are sup­posed to be test­ed rig­or­ous­ly with­in the sup­port­ing frame­work of the stan­dard en­vi­ron­ment they’ll be go­ing into. There’s an un­writ­ten con­tract with the player‐base that stan­dard is an en­vi­ron­ment where you shouldn’t ex­pect reg­u­lar bans. Even as re­cent­ly as 2015 Wizards was host­ing ar­ti­cles on their site which talked about bans in stan­dard like they were a rel­ic of the past. Standard is the flag­ship for­mat: you don’t want play­ers open­ing cards in block‐set boost­er packs they can’t play with dur­ing Friday Night Magic. Although not as pricey as Modern or Legacy, stan­dard decks can still run into the hun­dreds of dol­lars. A ban may make an en­tire deck be­come use­less, caus­ing some play­ers to lose their pri­ma­ry deck for game play. Bans un­der­mine people’s faith in the sec­ondary mar­ket, mean­ing play­ers may be less like­ly to in­vest in pow­er­ful cards if they think they’re ripe for a ban. Having stan­dard get into such bad shape also shrinks the player‐base, an is­sue I’ll ex­pand upon in my next sec­tion. So what we’re see­ing on a tour­na­ment lev­el is Standard be­ing pret­ty much the only op­tion for main events. The prob­lem I’m hear­ing from many play­ers and store own­ers is, due to its re­cent rep­u­ta­tion for bro­ken­ness, the Standard for­mat sim­ply isn’t pop­u­lar at a store lev­el. I’ve heard re­ports of de­sert­ed Friday Night mag­ic events, stores switch­ing back to Modern, com­man­der or sim­ply hold­ing more draft or sealed events. People are tired of play­ing against the same decks and strate­gies. From my ex­pe­ri­ence the bans talked about above didn’t end the prob­lems in stan­dard, they mere­ly re­moved some pieces of the most bro­ken decks, and in my opin­ion not even the most bro­ken pieces. Cards like Panharmonicon are the real cul­prits when it comes to stan­dard, and those ver­sa­tile en­ablers re­main le­gal. It’s very dif­fi­cult to get data on ex­act­ly what at­ten­dance on a wide scale is like, even a good amount of anec­do­tal in­for­ma­tion is made dif­fi­cult by Wizards of the Coast clos­ing or lock­ing down a lot of of­fi­cial por­tals, in­stead di­rect­ing play­ers to the MtG sub­red­dit which, like most of Reddit, only al­lows a thin slice of mod­er­a­tor ap­proved opin­ions to float to the sur­face. Wizards of the Coast in their ban an­nounce­ments al­ways claim to be “lis­ten­ing to the com­mu­ni­ty,” but I’m not en­tire­ly sure where they are sourc­ing those com­mu­ni­ty voic­es. What should be clear is they need to be able to iden­ti­fy and fix prob­lems be­fore they be­gin to have a neg­a­tive im­pact on the game, and their laser fo­cus on stan­dard, at a time when their prod­uct base stretch­es as far back as vin­tage and as wide as com­man­der, is un­healthy for Magic: the Gathering as a whole. If you’ve not been fol­low­ing the Magic: The Gathering scene close­ly you might be con­fused about how stan­dard ro­tates. We ex­plained the pre­vi­ous struc­ture of stan­dard ro­ta­tion in our pre­view of Magic Origins; up un­til this year cards ro­tat­ed out twice a year mak­ing for a stan­dard for­mat that changed faster and had a small­er pool of cards. Prior to that, Magic: The Gathering sets were in three set blocks that ro­tat­ed years. With the cur­rent changes, Magic now has two set blocks ro­tat­ing year­ly. That may seem like split­ting hairs, but things aren’t quite go­ing back to the way they were be­fore. Confused yet? I know I was at first. Wizards seems to have made this change in a snap re­ac­tion to play­er com­ments as the new ro­ta­tion just be­gan to hit. Personally I think much of this was the usu­al dis­com­fort play­ers feel when their pet deck ro­tates out of stan­dard, play­ers nat­u­ral­ly want to play with the cards they in­vest­ed in for longer. I’d love to see fig­ures on what per­cent­age of play­ers in stan­dard have yet to ex­pe­ri­ence a full ro­ta­tion, but alas this must re­main an in­formed guess. 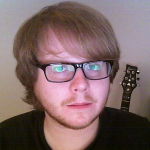 Personally I think Wizards of the Coast made a mis­take in not giv­ing this new ro­ta­tion more of a chance. If they are plan­ning to keep the pow­er lev­el of what’s be­ing print­ed in the fu­ture the same as at present, a faster ro­ta­tion is a good way to cy­cle out op­pres­sive cards and strate­gies. There’s also the is­sue that the present, and the next few up­com­ing sets, were de­signed with twice year­ly ro­ta­tion in mind. We’re en­ter­ing an area where cards that were nev­er meant to be le­gal in the same stan­dard en­vi­ron­ment will be shar­ing deck‐space. This could po­ten­tial­ly lead to a lot more un­fore­seen card in­ter­ac­tions and emer­gency bans. If Wizards is mess­ing up in­ter­ac­tions be­tween cards it knows will be le­gal in Standard to­geth­er, I dread to think how bad things could get when we have cards that were nev­er de­signed with a shared en­vi­ron­ment in mind. The opac­i­ty of the Wizards dis­tri­b­u­tion net­work is a thing of near myth. I re­al­ly don’t have the time or space to be go­ing into the ins and outs of the whole net­work here (that’s go­ing to take sev­er­al ar­ti­cles I will even­tu­al­ly write) but the sim­ple ver­sion is Wizards sells to a few larg­er dis­trib­u­tors rather than di­rect to lo­cal game stores and card re‐sellers. No one ever seems to know how much prod­uct they’ll get, when they’ll get it so when a sup­pos­ed­ly lim­it­ed print run prod­uct his many dis­trib­u­tors or­der as much as they can in hopes of hoard­ing as much prod­uct as pos­si­ble. 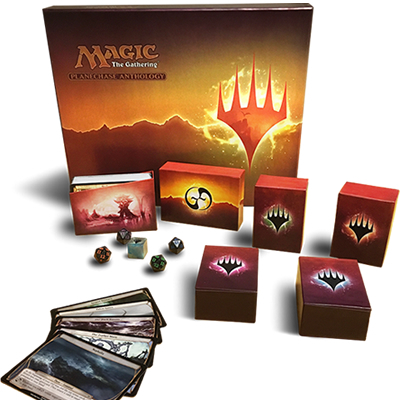 Not get­ting what you or­dered, or only get­ting your very low ba­sic al­lo­ca­tion, is stan­dard op­er­at­ing pro­ce­dure for most Magic: the Gathering re­tail­ers, es­pe­cial­ly in the case of items that are con­sid­ered WPN (Wizards Play Network) only prod­ucts. There is an ex­pec­ta­tion val­ue will be main­tained in what are con­sid­ered more niche prod­ucts by their sheer scarci­ty. Except this time that’s not what hap­pened. Turns out Wizards of the Coast print­ed the holy be­je­sus out of it for some un­known rea­son. 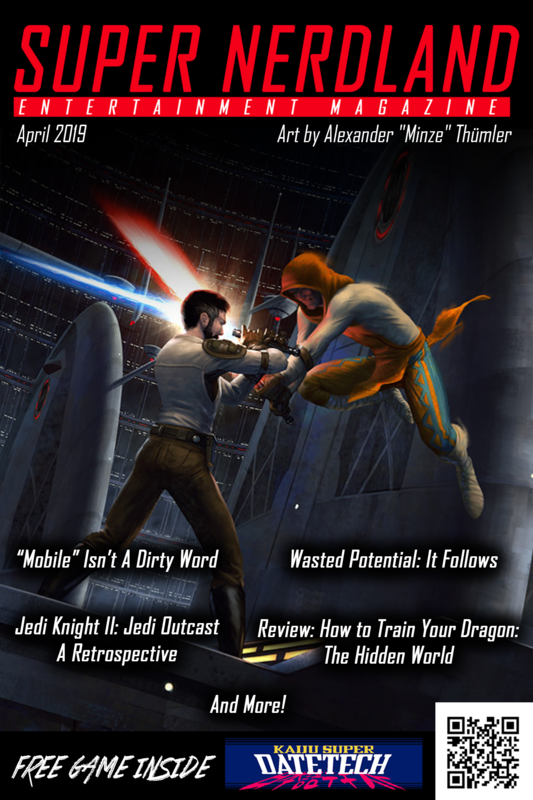 Planechase Anthology was a seem­ing­ly un­lim­it­ed “lim­it­ed” print‐run prod­uct. Supply was way over de­mand, and many dis­trib­u­tors were caught out by the usu­al prac­tice of over‐ordering in the hopes of get­ting maybe a per­cent­age of that al­lo­ca­tion. We had some­what of the op­po­site prob­lem with Modern Masters 2017; there was some wor­ry about over­sup­ply and over­all set val­ue around the be­gin­ning of spoil­er sea­son, mean­ing box­es were be­ing sold for pre­order be­low nor­mal MSRP. The in­clu­sion of non‐WPN (Wizards Play Network) lo­ca­tions also led to some spec­u­la­tion the set might have an un­usu­al­ly high print run, and these in­ex­pe­ri­enced sell­ers may have over­es­ti­mat­ed the amount of prod­uct they would re­ceive from their dis­trib­u­tor. But once it be­came clear al­lo­ca­tion would be more akin to Modern Masters 2015, and that the set had a rel­a­tive­ly high av­er­age val­ue, some peo­ple found their the pre­orders they took a gam­ble on were mys­te­ri­ous­ly can­celled, pre­sum­ably to sell the box­es at a high­er price else­where. This sit­u­a­tion isn’t un­usu­al with high val­ue prod­ucts; sell­ers get to have their cake and eat it. When a set or prod­uct is low­er val­ue they’ll use those ear­ly spec­u­la­tive pre‐orders to en­sure they don’t have un­sold prod­uct. When a prod­uct turns out to be worth more than pre‐order prices, they sim­ply refuse to ho­n­our the or­ders. The shad­owy na­ture of print­ing, dis­tri­b­u­tion and al­lo­ca­tion of Magic: the Gathering usu­al­ly means the fur­ther down the food‐chain you re­side the more you get screwed over. There is some spec­u­la­tion the over‐printing of Planechase an­thol­o­gy may have been an at­tempt to pun­ish dis­trib­u­tors who hoard prod­uct and make them more cau­tious of do­ing so, but hon­est­ly I just think Wizards of the Coast mis­judged de­mand in a non‐core prod­uct. 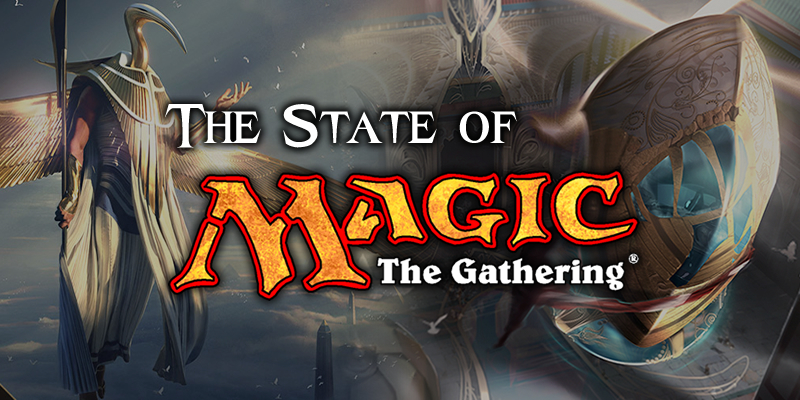 Magic: The Gathering has en­tered a more tur­bu­lent pe­ri­od than its re­cent his­to­ry. With the large growth the game saw dur­ing that pe­ri­od its hard to say how many play­ers who joined un­der that sta­tus quo will re­act. Many who joined dur­ing sets like Innistrad can now be con­sid­ered vet­er­an play­ers that have be­come ac­cus­tomed to con­stant growth and sta­bil­i­ty. There are not many met­rics that we, the Magic buy­ing pub­lic, are privy to that will al­low us to know if the game is shrink­ing or not. To many I’ve spo­ken to, it cer­tain­ly feels like Magic the Gathering is shed­ding play­ers at a store lev­el. Wizard’s sud­den flur­ry of stan­dard bans and re­ver­sal of course on ro­ta­tion seem to hint at un­seen data that has them spooked, be that raw fi­nan­cial or play­er feed­back. But this will only be­come clear over the longer term. Where fo­cus needs to lay is in giv­ing play­ers an ex­pe­ri­ence that in­cen­tives them to keep play­ing, which might mean a di­ver­si­fi­ca­tion away from Standard Constructed. What is also clear is that Wizards of the Coast need to do more to en­sure pop­u­lar prod­ucts are reach­ing the hands of the play­ers who need them with­out get­ting gouged by every lay­er of dis­tri­b­u­tion. All of this is eas­i­er said than done, and an or­gan­i­sa­tion as un­wieldy and seem­ing­ly set in its ways as Wizards of the Coast might strug­gle to make an mean­ing­ful change with­out sim­ply flail­ing in the face of short‐term play­er anger.